Campaigning is hard work and Meenakshi is more than ready for the challenge. Meenakshi Seshadri takes a strike. Meenakshi Seshadri is a very busy woman, spending her days campaigning for her husband, the Congress candidate for Bangalore North, Krishna Byregowda. 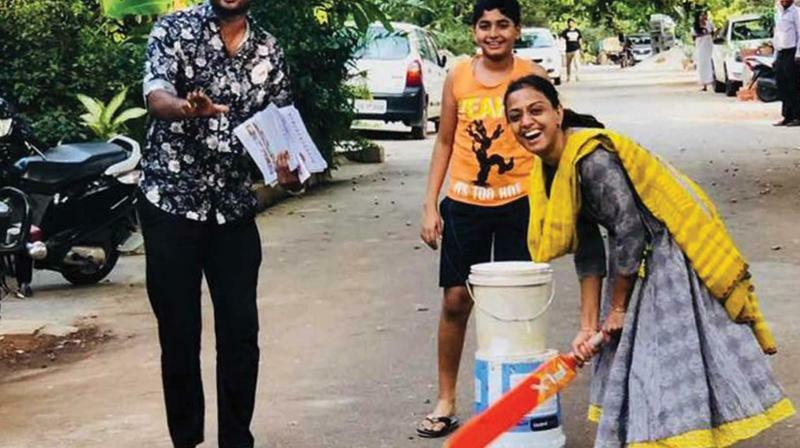 Going on her rounds in Palace Guttahalli, where she and a group of party workers made door-to-door visits and rounds of commercial establishments, she unleashed a tirade of criticism against the NDA government, dismissing the Modi wave as a ‘myth’,unlike what is being portrayed in the media. “In fact, the aam aadmi and the middle class have suffered at the hands of Modi and policies like GST and demonetisation. People are still recovering from these disastrous moves,” she said. Campaigning is hard work and Meenakshi is more than ready for the challenge. Always an early riser, she says long hours of yoga keep her physically and psychologically fit, despite the searing heat. “I venture out soon after getting ready and do not believe in doing pooja. Sometimes, I even pack my breakfast and eat it either on the way or at the homes of karyakartas (party workers),” she recalls. Elections must be fought on individual capacity and not on someone else’s name or charisma. KBG is popular as the Millet Man. His efforts towards changing the life styles of people and re-orienting them towards a healthy routine have been acknowledged. With you for you #KBGforBLRNorth is the clear and loud message that Meenakshi has been carrying for the voters and says “do vote – don’t forget to pick candidate wisely”. Unlike other supporters she goes on foot to seek votes and does not use loud speakers.